Today, I had the pleasure of being involved in a project to help our youth become tomorrow’s engineers. The idea around this program is to help students to understand the basics of electronics, programming, and computing through the use of Minecraft. For those of you who do not know what Minecraft is, it’s a game that is played in a virtual land where users create their own worlds and experiences, using building blocks, resources discovered on the site and through their own creativity. Think virtual legos. Minecraft focuses on creative building and exploration that helps children build problem-solving skills and improves their ability to work as a team. The game has even been credited for helping build social and communication skills for autistic children. With tools like this, we are helping develop our next generation of creators. About six months ago I was attending a Microsoft event where I met a young entrepreneur who is following his dream of one computer for every kid in the world. His name is Mark Pavlyukovskyy and he is one of the founders of PIPER. PIPER has developed a way for kids to start their journey into engineering at an earlier age and become creators. They do this through a computer kit that PIPER has designed that allows kids to learn as they play minecreaft. 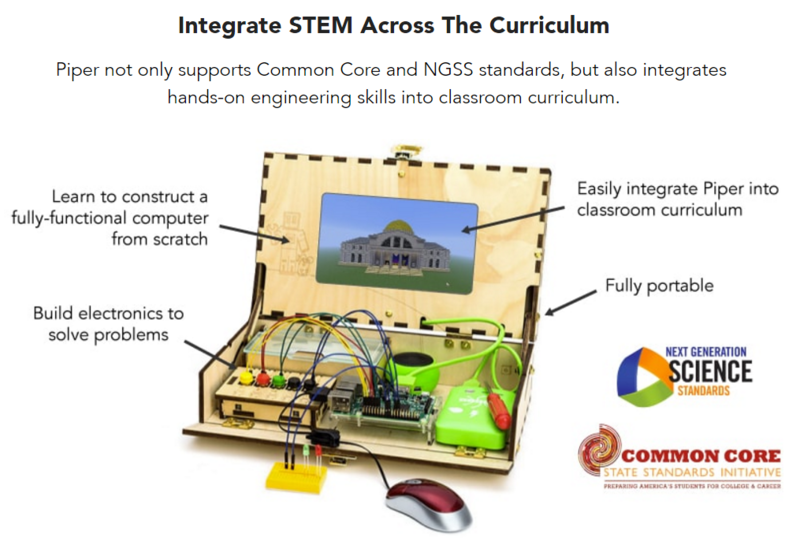 The kit is meant for ages 7 and up and it allows the kids to first understand how to build a computer and then use it to learn programming. Piper has developed a curriculum that was endorsed by Stanford that enables teachers to bring this to the classroom. I was so impressed with Mark and his team’s dedication and devotion to helping kids learn in a different way that I wanted to get involved. I told Mark that I would like to get this into one of the schools in my local area as soon as we could find one that was willing to participate. A few months had passed and then I received an email from Chris Bowman who was in charge of the outreach program at Piper. He mentioned that he had a local school who was interested in the program and was wondering If I was still interested in helping fund the program. Of course I was excited and this is where our journey began. Through the help of a few select donors, we were able to fund 16 Piper Computer Kits that will be used across the Campbell Union School District. Monroe Middle School in San Jose, CA, is the first school chosen to participate in the program. The kickoff of the project was held today and it was a pleasure to be invited by Sherry Burch, STEAM Teacher/Coach of Campbell Union School District. Seeing how excited these kids were to have the opportunity to learn using the Piper Computer Kit was very rewarding. I am excited to see how this turns out and to hear feedback from the kids upon completing the program. So many kids will now have a chance to learn about electronics, programming, and computers at a much younger age through this program. I can’t speak highly enough for the group of individuals at Piper who have made this dream of theirs become a reality. Kudos to what you are doing for today’s youth. A special thanks to Sherry Burch for her devotion to teaching kids science, technology, engineering, arts, and mathematics. In addition, I would like to thank Groupware Technology and Bill & Melinda Gates Foundation for their donations. You are helping to make a difference in these kids lives. It will be exciting to see what our next generation of creators will be able to accomplish. If you or someone you know is interested in getting started with this program in your local school, feel free to reach out to me and I can assist in connecting you with the right people.